Sean C. Bjork brings his experience as founder of Bjork Asset Management to 401k Advisors with the goal of providing unparalleled investment expertise and disciplined, independent fiduciary guidance to institutions sponsoring retirement plans and their employees. As a recognized leader in the retirement plan industry Sean has over a decade of experience working with retirement savings plans and their participants. 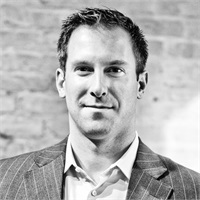 Sean earned his MBA in Finance from the University of Chicago and earlier graduated with a BA from St. Lawrence University where he was also captain of their NCAA Division I Alpine Ski Racing Team. Beyond his work at Bjork Asset Management and 401(k) Advisors, Sean is an active conservationist, outdoorsman and pilot. 2015 Financial Times Top 401K Retirement Plan Advisors Award recognizes financial advisors advising at least $50 million in defined contribution (DC) plan assets where DC plans represent at least 20% of total AUM. Graded on several criteria, including growth in DC plans and assets, plan participation rates, experience and industry certifications, and compliance record.